Nature's Transdermal Face food™ is a clay mask that pulls out toxins while pushing nutrients deep into the dermal layers of your skin. 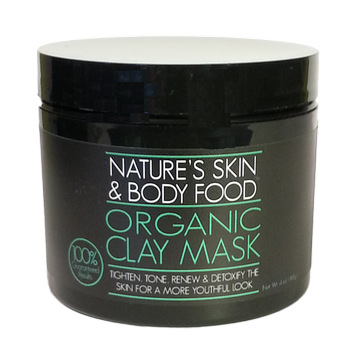 No other clay mask has almost 80 minerals in an organic form that your cells can instantly use to repair and renew your skin. Everything we do at Nature’s Skin and Body Food is about your health and beauty. We manufacture products that produce results. Nature’s Transdermal Face Food™ is the result of years of research and development, powered by our mission to discover the most powerful and effective natural substances for skin renewal and anti-aging from around the globe. The main ingredient in Nature’s Transdermal Face Food™ is based upon an important discovery regarding why certain groups of people living in a few isolated areas of the world (the Ural Mountains of Pakistan, the Caucus Mountains of Georgia and Russia, the Andes of Peru, the Himalayas of China, and the Wasatch Mountains of Utah) can live to the age of 120 to 140 years old. Scientists discovered a rare montmorillorite clay in the soil of these regions that was particularly rich in minerals. After that discovery, our company began researching why this special clay had been proven to increase enzyme production in living cells. After verifying these results, we discovered only one small clay deposit with the proper molecular structure that would allow these rich minerals to be absorbed directly into the skin by topical application. 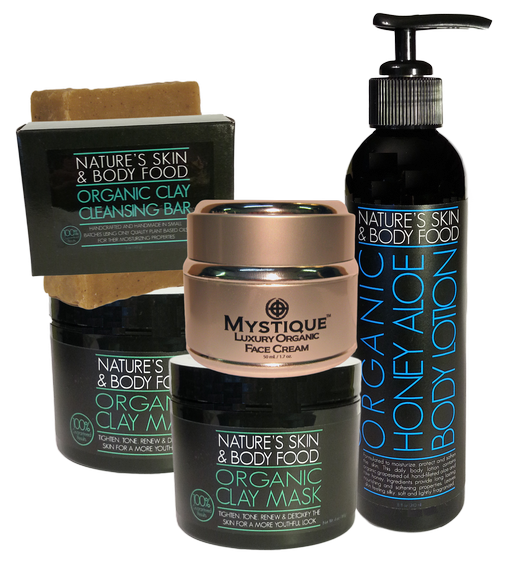 Nature’s Transdermal Face Food™ is the only product available which utilizes this rare clay as it’s main ingredient to deliver these vital nutrients through the skin. Nature’s Transdermal Face Food™ also includes the essences of 24 proprietary extracted organic and/or wildcrafted herbs that have been proven to restore, rejuvenate, or regenerate the skin. Finally, we add a mixture of deeply penetrating oils along with the delicious fragrance of essential oils to create the most powerful, all natural skin rejuvenation product ever developed. Applying Nature’s Transdermal Face Food™ to your face will infuse your skin with a wealth of nutrients, will remove damaging toxins, and will give you amazing age-fighting and skin regenerating results. You will also experience outstanding exfoliation, hydration, and superior anti-oxidant protection. The pores of the skin will become smaller, and the skin will generally appear smoother, more toned, and tighter. Your skin will radiate with a healthier and more vibrant glow. Instructions: Guidelines for best results. Apply on a thoroughly cleansed face as follows: 1) Using your fingers or an applicator brush spread a layer of Nature’s Transdermal Face Food over the entire face, avoiding the eye area. 2) Leave the mask on for 5 to 20 minutes 3) Remove by washing with warm water either with a wash cloth or in the shower or bath. 4) Towel dry and then if needed apply added moisturizer. The mask will exfoliate, nourish, and moisturize. Note: The Mask will remain active on your face for about 12 hours after it has been removed. It is recommended to have an interval of at least 24 hours between treatments. You will notice an increase in blood flow to the skin which is normal. The nutrition from this mask will also benefit your overall body. An increase in energy and calmness is a normal effect after applying your mask. Anti-Aging requires removing the dead skin cells to assist the emergence of new skin. As you keep using the mask your results will become more pronounced. Guidelines for recommended Use: Daily or every other day applications will produce the best results, however even limited use such as once or twice a week will produce solid results. As with all masks, avoid getting product into the eyes. If you do so rinse thoroughly with water. If your skin appears or feels irritated during use, rinse the mask off with cool water and discontinue use. Keep away from heat. Check Out the Ingredients in "Nature's Transdermal Facefood"
Transform your skin in 15 minutes - click this link to learn how.